Rita (CH Snowfire's five O-clock Somewhere) and Hudson (CH Snowfire's Down by the Bay) 4 Boys and 1 Girl. We have been involved with Samoyeds since 1996. We are members of the CKC (Canadian Kennel Club), SAC (Samoyed association of Canada). We are involved with Samoyed rescue and believe these dogs need to be challenged and have lots of activities. We participate in pet therapy with our dogs and do some recreational sledding as well. 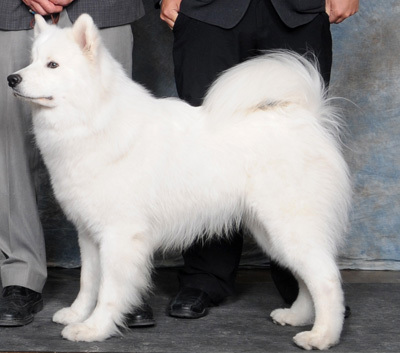 Our breeding program is built on respect and genuine care for the Samoyed breed. All of our breeding stock have been shown in the conformation ring. They live in a home environment in the house and participate in all of the family activities. All puppies are well socialized with people of all ages and with other dogs. They all have their hips OFA certified and eyes are checked and clear. We maintain that our dogs are family members first and foremost and are treated that way. They get all the medical attention they require and are kept in good health with lots of love. From time to time, we will breed when the time is right and we feel we can improve on the breed. When these breedings happen, there are sometimes puppies available for both pet and show homes. We screen our homes very carefully and insist they will be placed in good loving ones. All of our dogs come with a complete health guarantee and lots of free advice, all of the dogs we breed are a lifetime commitment . All of our puppies are sold on a non breeding contract. We will require proof of Neutering on all dogs sold to pet homes. For Show/breeding homes the non breeding contract will be removed upon proof of Hips and eyes passing and championship. We would like the homes our dogs are going into to have a fenced yard and a real knowledge of what having a puppy is about. If you are interested in possibly owning a Snowfire Samoyed please fill out our puppy questionnaire.